Shopping for Universal Monsters Prop Replicas? Cast from the original Dracula ring prop! Exquisite detail on Dracula's ring! 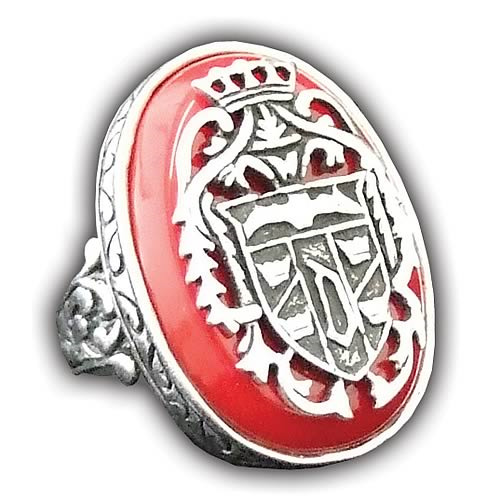 Take home this Ring of Dracula Collectors Edition Prop Replica today! This ring is movie accurate and cast from the original prop. The ring was worn by some of the most-admired actors to have played Dracula in the classic Universal Monsters movies. The Dracula Ring Replica features an antiqued metal finish and reproduction stone, in displayable packaging. Ring band size measures 10 1/4. Wear it with pride!